Stockton Veterinary Hospital establishes a new benchmark for community based Veterinary Care. 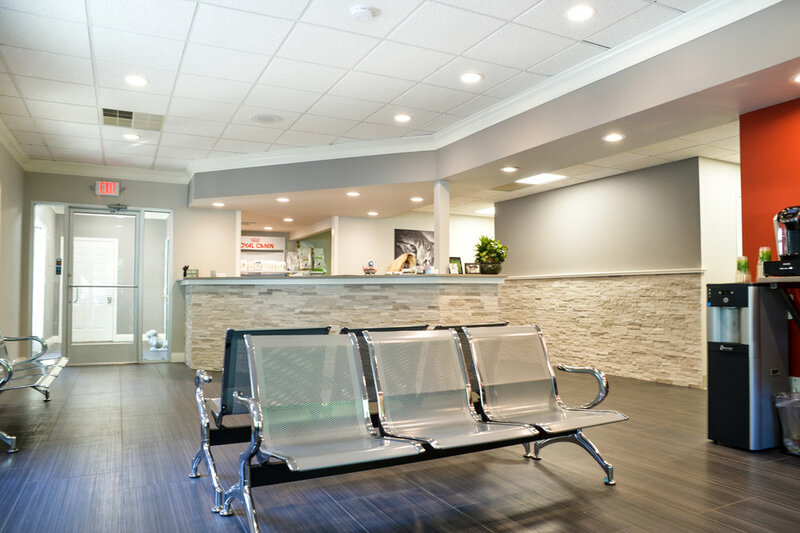 By combining the highest standard of veterinary medicine and the newest, cutting edge technology, Stockton Veterinary Hospital inspires confidence and loyalty from new patients and existing customers alike. Through compassion and innovation our clients and patients realize our commitment not only to veterinary excellence but also state-of- the-art diagnostic and therapeutic care, from the beginning to the end. This includes, but is not limited to, promoting health and well-being, both physically and behaviorally, and alleviating illness, pain and suffering. The impetus behind this vision is simple; provide the finest, most advanced medical and diagnostic technology and pair that with a fundamental desire to be an integral part of the community. In addition, promote superior health and well being through effective education for those passionate about their pets. Services range widely from prophylactic pet wellness and behavior, to elective and emergency surgical procedures. In addition, SVH will utilize a number of highly sophisticated diagnostic and treatment modalities currently unavailable at other local hospitals. We're just as passionate about your pet as your are. Their health and happiness is our number one priority. We'd love to discuss the ins and out of our practice or any other questions you may have. If you're ready to book your first appointment, we are waiting patiently to get you on the calendar. Click the link below to get started. Trained at the prestigious University of Liverpool in England, and Cornell University, NY, “Dr. Charlie” has been in practice since 2003. She started work as a large and small animal veterinarian in England and Wales, and then moved to Hunterdon County where she is now a resident of neighboring Frenchtown, NJ, with her husband Angus. After over a decade of experience in local practice, Dr. Charlie has had the opportunity to identify the specific needs of our local community. Through Stockton Veterinary Hospital, it is her intent to create a facility consistent with these sensibilities and a vehicle to continue to serve her growing family of patients and owners. She also enjoys her three dogs, Darla, Hugo and Tatty, her orange cat Schmerb and 8 chickens. Dr Charlie is excited to be located on the Delaware river due to the benefits it offers – biking, kayaking, hiking the trails, and all the river towns along the way. Julia C. Coughlin, DVM aka, "Dr. Julia"
Julia has loved and studied animals from a young age, especially dogs. She worked as a veterinary technician in New Jersey and Pennsylvania for 6 years prior to receiving a Bachelor’s degree in biology from University of the Sciences in Philadelphia. She was then accepted to veterinary school at Saint George’s University and completed her clinical training at Oregon State University. After graduation, she returned home to the beautiful Delaware Valley with her husband, 3 dogs and cat. Julia enjoys caring for all creatures, great and small. In addition to cats and dogs, she is happy to care for chickens, pigs, goats, sheep and koi. Ashley Males, a lifelong resident of Hunterdon County NJ began her love affair of working with animals more than twenty years ago. Her extraordinary passion became very evident well before the tender age of 12 when she began her career in animal welfare & rescue. Ashley's meticulous and vast experience within the equine, canine and feline species has fostered undeniable popularity and trust between herself, her colleagues, the animals & their owners. Having the opportunity to work daily towards the goal of improving the lives of animals is the most gratifying position she has and will ever hold. To be able to live out and fulfill this dream has been nothing short of amazing. In her spare time, you can often find Ashley and her son Blake hiking mountains, reservoirs, and road tripping with their two over-sized lap dogs, Kylie (the Australian Shepherd/ English pointer) and Norman (the American Bulldog). When she returns from her expeditions, you'll then see them saddling up Klik Klak (a Dutch Warmblood) while Flash (a Welsh pony) keeps a watchful eye over the day's events. Dr. Hamilton has worked in veterinary medicine his entire life, starting as kennel help at the age of 14. After completing his undergraduate degree in psychology, he stayed at Colorado State University to complete his doctorate of veterinary medicine. Dr. Hamilton spent two years in general practice in Las Vegas then went on to start his oncology residency at Michigan State University. As a board-certified veterinary oncologist, Dr. Hamilton has been commissioned to start multiple oncology departments in the northeast, he participates in clinical trials and is asked to do lectures frequently. He deeply enjoys the bettering of lives of oncology patients and working with their owners to ensure the best quality of life possible. This passion motivated Dr. Hamilton to bring oncology specialty care to the general practice setting, allowing some pet owners, their veterinarians, and specialists to work together in one setting. When not at work, Dr. Hamilton enjoys hobby farming and tending to all his critters. Dr. Ting is board certified by the American College of Veterinary Surgeons. He has particular interests in orthopaedics, traumatology, and oncologic surgery. He is trained in minimally invasive surgeries such as fluoroscopic-assisted fracture repair. Dr. Ting has published a number of original orthopaedic articles in various veterinary journals and has presented numerous lectures on international, national and local levels. He remains active in veterinary continuing education and is a leading instructor in veterinary orthopaedic courses.